Happy Thanksgiving! I hope my fellow Americans (and everyone else Thanksgiving-inclined) enjoyed a day of feasting, time with family and friends, and of course napping. I had quite an exciting Thanksgiving: I was invited to the U.S. ambassador to Rwanda’s residence for a potluck dinner. It was an incredible gastronomic experience that almost made up for missing my family’s home-cooked meal, complete with an American turkey, gravy, stuffing, cranberry sauce, mashed potatoes, roasted vegetables, fresh salad, pumpkin pie, apple pie, whipped cream, and more. I never imagined I would enjoy such an American feast and I can’t say I’m disappointed that there was no roasted goat or rice and beans. The ambassador and his wife were lovely and it was great to get to know some of the embassy staff over a savory banquet. I’m thankful for my family – my parents, sister, grandparents, aunts, uncles, and cousins – who have supported me without fail throughout all of my crazy adventures. I’m thankful for my friends all over the world who are there for me no matter what and who always make the extra effort to stay in touch. I’m thankful for my new friends, neighbors, and colleagues here in Rwanda who have made me feel welcome and who have helped to create another home here. I’m thankful for Princeton-in-Africa for giving me this unique opportunity to work with Generation Rwanda and truly immerse myself in Rwanda. I’m thankful for the Generation Rwanda students who inspire, encourage, and teach me every day. I’m thankful for all of the teachers I’ve had over the years – professors and mentors at Tufts, my high school teachers, friends, mentors, and colleagues in the U.S., Haiti, Uganda, Rwanda, Switzerland, Nicaragua, and more, who have all helped shape the path I’m on and the way I see the world. I’m thankful for the incredible educational opportunities I have had my whole life. And I’m thankful that my education continues every day. I’m thankful to have been born into a loving and supportive family. I’m also thankful to have been born in a country where there are systems in place that usually work to help people succeed. I’m thankful to have the opportunity and the drive to help other people around the world where there aren’t systems in place to help them succeed. I’m thankful for having enough food on my plate every day. I’m thankful to have running water, electricity, and internet (and especially Skype). I’m thankful for the existence of washing machines and dishwashers. I hope to be reunited with them soon. 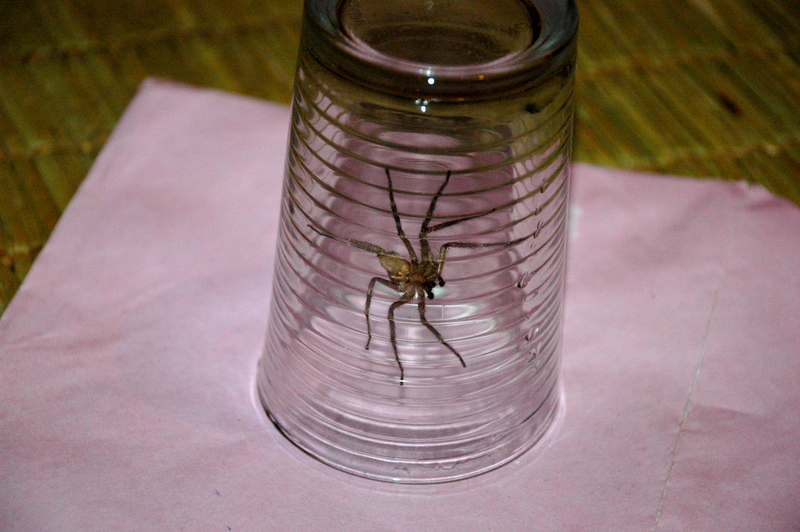 I’m thankful for the mosquito net above my bed. I’m thankful for the delicious passion fruit ambrosia here. I’m thankful for all of you who read my blog! What fascinates me about experiencing other cultures are the everyday norms and rules, some subtle and some obvious, that differ from my own culture. Here are some interesting insights I’ve picked up so far throughout my time in Rwanda. They come from conversations with Rwandans, personal experiences (often in the form of trial and error or faux-pas), and my own observations. I’ve grouped them together under different category headings. It is considered extremely rude to eat in public; meaning in the street, on public transportation, and sometimes even at large parties where strangers are present. In addition, adults don’t eat in front of their in-laws. In the past, adults didn’t even eat in front of their own children and would often take their food into their bedroom. Some men will only eat their wife’s cooking and will refuse to eat any food cooked by a housekeeper. It was said in the past (and sometimes still today) that women are not supposed to eat goat meat, for two reasons: 1) It will make them grow hairs on their chin, and 2) It will make them stubborn. However women tell me that that “rule” was invented by greedy men who wanted all the good meat. It is said that if a couple eats their dinner lying down in bed, their children will be selfish. Most of the bananas here are mini, about a third of the size of American bananas. They come as a bushel, and sometimes two mini bananas grow to become fused together. If a woman eats a double banana, it is said that she will give birth to twins. Going out to eat at restaurants is actually a fairly new concept that has only taken hold with the influence of foreigners. In the recent past, if a man or a couple went out to eat, it meant that the wife was a bad cook or that the man did not have a wife at all. Even today there are many Rwandans generally do not dine out, either for financial or cultural reasons. Rwandans say that if you eat fish brains, the devil will come visit you that night. Some Rwandans refuse to eat beans because they say that eating beans makes one’s skin become darker. If someone has very dark skin, Rwandans will say that s/he must have eaten a lot of beans. People say that eating green bananas causes people’s butts to become fat. Similar to a Jewish dietary rule, it is forbidden to eat milk and meat together. In the past, it was considered taboo for in-laws to eat at a married couple’s house. It was also taboo for them to stay the night and they would have to find another place in the neighborhood to stay. If someone is able to creep up behind you and make you bend by pushing on the back of your knees, it means that you can’t make good ugali (a doughy dish made from different types of flour and dipped into sauce). Rwandans say that drinking milk makes women beautiful. When there is a beautiful woman, Rwandans might say that she must have drank a lot of milk. Two of the main beers here are Primus and Mutzig. It’s said that men typically drink Mutzig and women drink Primus. However I’m partial to Mutzig and one of my good Rwandan male friends is partial to Primus, so I’m not sure how serious that tendency is. When Rwandans are served a bottle of beer with a glass, they will sometimes pour a few drops into the glass, swish the liquid around, and then pour it on the ground behind them. This serves two functions: it symbolizes sharing the drink with ancestors and also helps clean out the glass. When a married couple has children, their names essentially change to reflect the identity of their first-born child. For example, my parents are named Joshua and Gloria. In Rwanda, as soon as I was born everyone who knows them (friends, family members, community members, neighbors, perhaps even colleagues) would start to call them Papa Helaina and Mama Helaina. It provides for interesting commentary on the location of identity and the importance of procreating and having a family. When a couple is planning a wedding, the man and the woman separately hold numerous “planning meetings” at which they meet with their friends and family to organize and finalize the details for the marriage. I attended one but wasn’t able to contribute much besides a smile and the occasional excited nod of understanding. One of the ways that the family of a bride prepares for a wedding is to plant a few banana trees along the road leading to their house. In the past this was done to show that the family was relatively wealthy, because it was implied that they could also supply their guests with banana beer from the banana trees. As soon as a couple gets married, the woman is expected to get pregnant. If she doesn’t get pregnant within a few months the entire family and community will judge and assume the couple is impotent. When a couple shares a bed, the man always sleeps on the side away from the wall so that he can protect his wife/girlfriend in the case of an intruder or problem. It is considered a serious taboo for an unmarried man to spend the night at an unmarried woman’s home. However it is a bit more acceptable, though still sometimes gossip-inducing, for an unmarried woman to spend the night at an unmarried man’s home. This is part of a larger discussion about gender and double standards/disparate access and opportunities: it is not acceptable for women to go out dancing without men. If they do so, they will be considered prostitutes. Traditionally, women in Rwanda are fairly meek when they are in public. There is a saying that my students told me – “a good woman is a silent woman.” Fortunately that paradigm is changing today – and I do my best in each class session to pull the girls out of their shells. Sometimes it feels like pulling teeth instead. However I’ve seen a gradual improvement in their confidence and willingness to volunteer their ideas, which is encouraging. I have observed at large parties or meals that women generally wait for the men to take food before serving themselves. This I assume is an extension of domestic hierarchy and deference on the part of women. It is completely acceptable for men to hold hands in public here. On one street I can usually count at least ten pairs of men (of all ages) holding hands and walking together. On top of that, men also walk arm in arm or arm over shoulder, share seats, sit on each others laps, dance very close, and do other intimate things that would peg them as homosexual in the U.S. However here in Rwanda, homosexuality is an extreme taboo so I suppose that’s why men can be so intimate. On a similar note, when men who are close friends greet each other, they embrace very intimately in what I like to call a “forehead kiss”: with eyes closed they touch opposite sides of the forehead twice and then once in the middle, while shaking hands or holding each other’s shoulders. It’s very sweet and endearing to watch. It is forbidden for a married person to say the name of his or her mother-in-law or father-in-law. When greeting them or even describing them to others, people cannot say their name and have to describe them instead. – Stubborn: This essentially means the opposite of serious; someone who is not respectable or reliable. 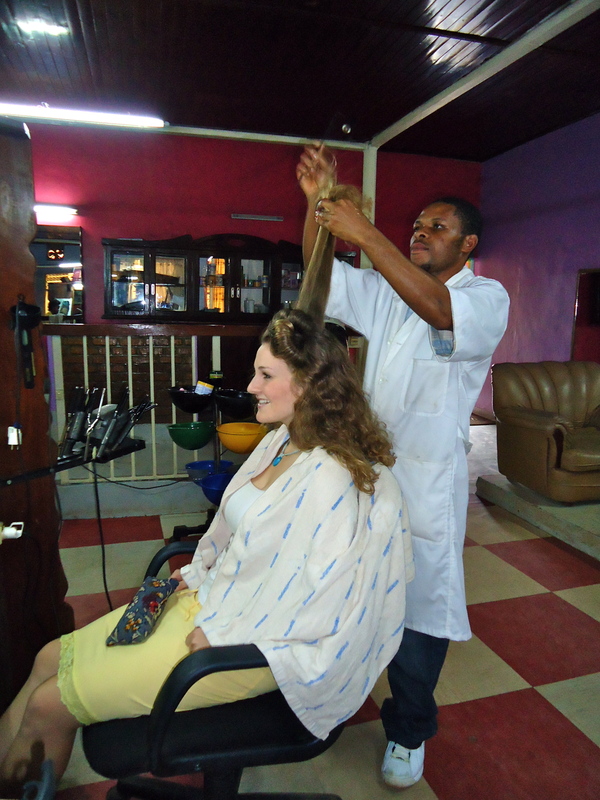 – Saloon: Appropriated to mean “salon” as in “hair salon.” The area where I live, Nyamirambo, is full of saloons. – Sambusa: Used to mean what I know of as a “samosa.” The term is also used in Ethiopia and Somalia. On someone’s birthday, friends pour a bottle of water over his or her head as they sing “happy birthday” in Kinyarwanda. I also learned that one the hard way. A superstition I have heard students tell me is that people with small handwriting are considered lazy and selfish, while those with big handwriting are considered generous and courageous. If a Rwandan lends something to a friend and s/he loses it, it is considered a taboo to ask the friend to replace it or pay for it. Rwandans just forget about the lost thing and move on. If a bird poops on your head, it means you will get rich. If you see a cat in the morning, your day will be bad. If you say the word “needle” (“urushinge”) before breakfast, you will have a bad day. If someone causes you to have an accident, either on purpose or by mistake, Rwandans believe that saying that person’s name in the morning is bad luck and, similar to the needle issue above, will cause you to have a bad day. For example, one night last week I was walking with some friends and I turned my head to answer my friend Amani’s question. 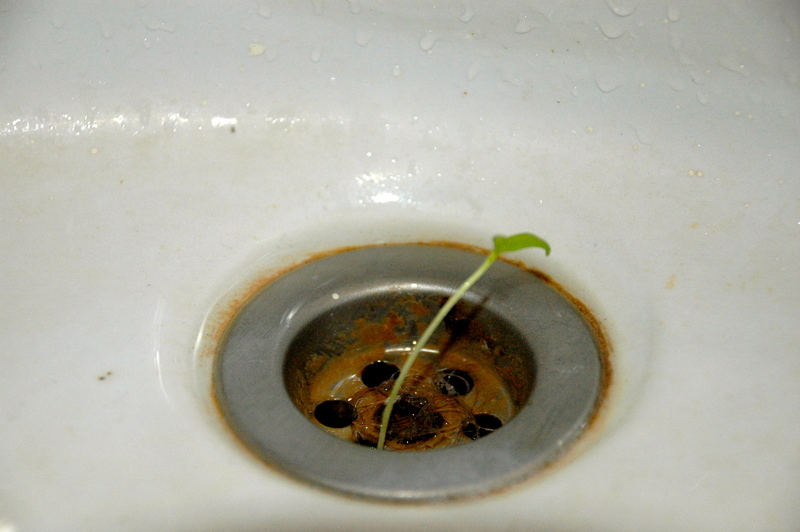 As I did so, I didn’t see a shallow gutter (luckily empty) in front of me and fell down, cutting my toe. A Rwandan friend told me that I should not say Amani’s name in the morning. Instead of the saying the unlucky friend’s name, Rwandans say “umutavugwa,” which means something like “speak badly” (or as I like to think of it, “he-who-shall-not-be-named”). When Rwandans wish you good night, they say “Sleep in a hard place.” The reasoning for this is that if you sleep in a soft place you will be so comfortable that you’ll never wake up. Many Rwandans believe very seriously in spirits and curses performed by traditional healers/sorcerers. Several friends have told me stories of people they know who have been cursed to become crazy after breaking up with a resentful boyfriend or girlfriend. In particular, the town of Kibungo in southeastern Rwanda is considered to be the hub of dark magic where many traditional healers/sorcerers reside. If a woman sews at night or in the dark, people will discourage her by saying that she is sewing her parents’ eyes shut. This is most likely to prevent women from straining their eyes by sewing under weak light. When you have the hiccups, Rwandans say that someone is talking about you. When you have a twitch on your eye or face, people say it is a good omen. Children up to age 10 were required to take a nap every afternoon after eating lunch and before returning to school. Even some adults still have this habit. I update this list as I continue learning more about the culture. For any Rwandans or Rwandophiles reading, please feel free to correct any misconceptions I have or contribute your own insight. Weddings are extremely frequent here, especially during the two wedding seasons of November-December and June. I’ve been trying to figure out why weddings happen so often and my unfounded speculation is that there may be a demographic bulge of 20-30 year olds. Because of societal norms and pressures, women tend to get married fairly young here, generally between the ages of 22 and 26. Men, on the other hand, have a longer single shelf life and may frequently be 5-10 years older than their wives. 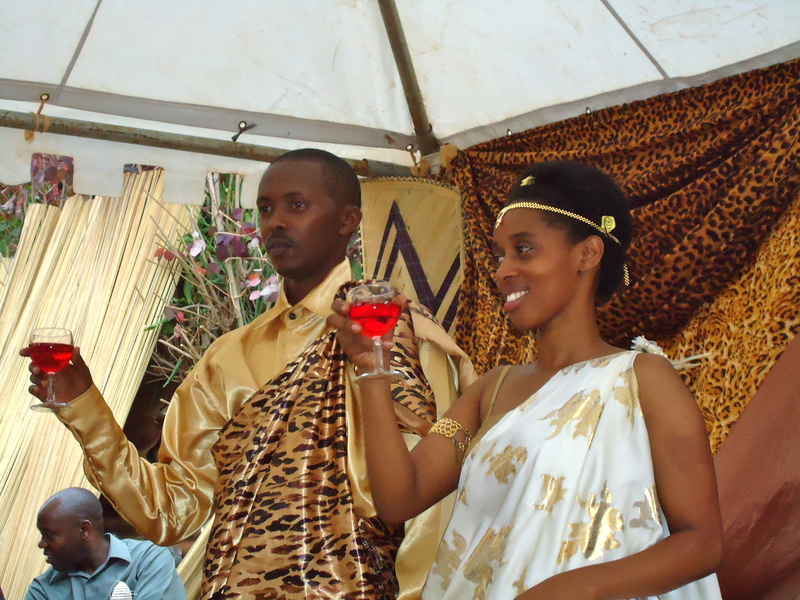 Rwandan weddings have three parts: a traditional introduction ceremony, a religious ceremony, and a civil ceremony. The wedding that I attended on Saturday was the religious ceremony, a full day affair that started at a church and ended in a reception hall. After a fairly typical Catholic service (illuminated by a near-constant stream of photographs), everyone drove to take more pictures at a nearby garden. Next, everyone returned to the church grounds and the couple entered the reception hall by passing through an arch and cutting a ribbon at the entrance. 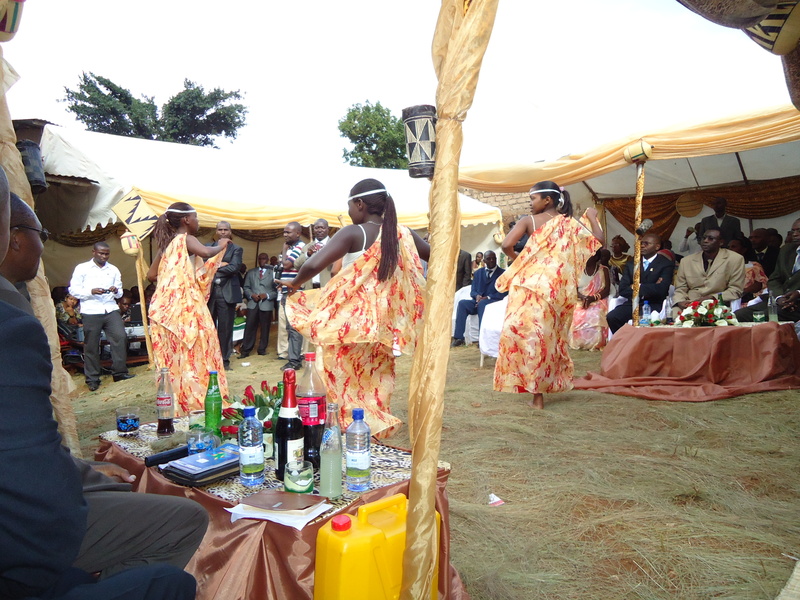 Unlike the freeform receptions at American weddings, this reception consisted of the guests sitting in audience rows watching members from the wedding party on stage give effusive speeches in Kinyarwanda. The whole reception was a type of dialogue between the two families, in which relatives discussed why the union between the couple was a good idea and why they supported it. At one point two bridesmaids approached the front of the stage where a tower of cakes was waiting and lit sparklers to put in each cake. Everyone was served some cake and Fanta and the sugar highs they provided were instrumental in keeping me awake during the rest of the two hour affair. As we were getting ready and waiting with Janet, sounds from the ceremony outside wafted through the windows that I kept trying to peek out of. The introduction ceremony is very complex and consists of numerous speeches from both sides of the family in which they discuss why the couple should marry, the giving of the dowry (in the past it was a cow but these days it’s usually just money), traditional dancing and singing, storytelling, and the official introduction of the couple to the public. About an hour into the ceremony, it was time for the bride to make her debut, flanked by the four of us bridesmaids bearing gifts for her to give to her fiance’s family. 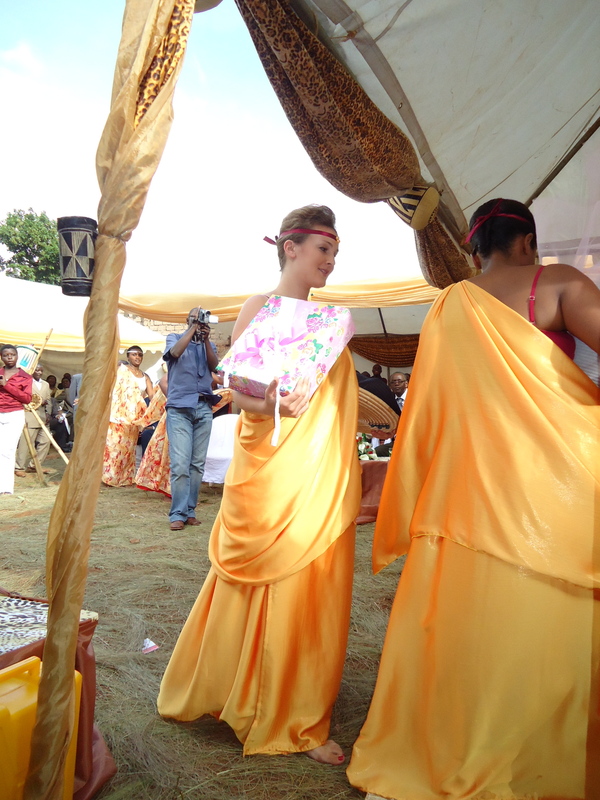 Along with the other bridesmaids and groomsmen (who were also dressed as hunters) I spent the rest of the ceremony sitting under the wedding canopy on a straw mat, trying to keep my mushanana from getting too dirty or crinkled. It was a delightful surprise when everyone at the wedding was served a full meal of meat, pasta, fries, and Fanta. 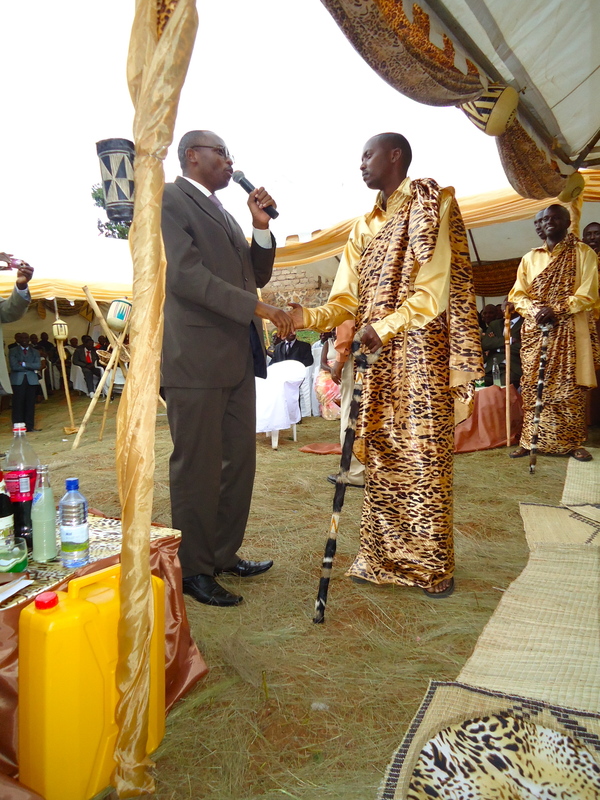 The ceremony continued with family members from opposite sides exchanging gifts and bestowing praise and wishes of success on the couple. It was a true honor to be so intimately included in Janet’s special day. 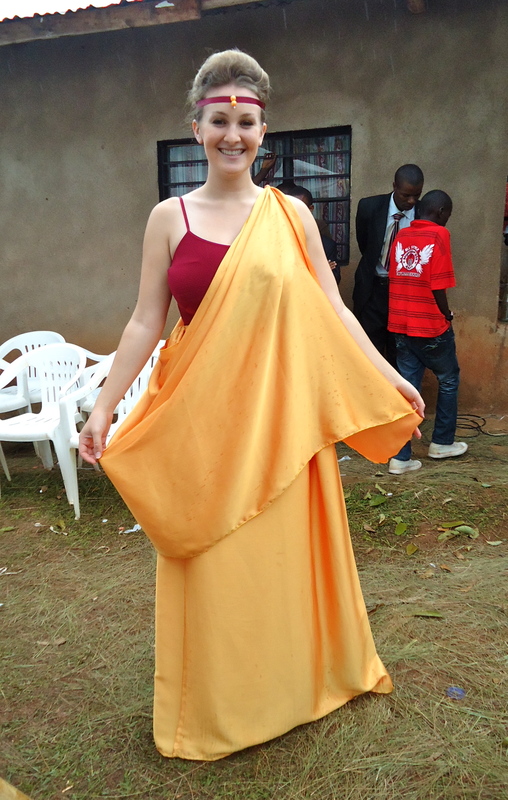 I’m looking forward to her religious ceremony (and three more weddings) next month, where I’ll be wearing the mushanana again – maybe by then I’ll be able to put it on by myself! About 15 hours ago, you would have found me on an overnight bus somewhere between Kampala and Kigali, curled up under a towel and praying that the bus’s centripetal force would keep it from giving out on one of the many precarious twists and turns in the potholed-road. Rewind: I spent this past weekend in Kampala, Uganda, with Mary and Caitlin, visiting my friend Meg and seeing the city. After a 5:45 am departure on Friday morning, we arrived in Kampala around 2 pm a bit discombobulated and without any phone credit or Ugandan shillings. We eventually made our way to Meg’s and settled in for the weekend, which proved to be a perfect combination of fun exploring, sightseeing, catching up with friends in Kampala, and relaxing. The weekend’s highlights included going to movie showings at the Kampala Film Festival, browsing through beautiful East African crafts shops, riding on lots of boda-bodas (motorcycle taxis), eating delicious pineapple and Rolexes (the oddly named but scrumptious chapati-omelette roll-up invented at Kampala’s Makerere University), going out to the expat bar Bubbles Oleary’s, and watching at least 5 episodes of 30 Rock. This weekend was my first time back in Kampala since summer 2008, when I spent five weeks interning for Educate!, an organization that equips secondary school students around Uganda with socially responsible leadership skills. It was surreal to be back, partly because I didn’t recognize a lot of the city because I had actually never explored it in full two years ago. Over the weekend, I got to catch up with my friend Eric, the director of Educate!, at New York Kitchen, a lively establishment offering fairly authentic bagels, pizza, and even red velvet cupcakes (don’t worry, Jbebble – they were good but nothing like your little drops of heaven). Being in Kampala made me feel like I was a country girl back in “the big city.” It reminded me of how small, calm, clean, manageable, orderly, quiet, safe, but less exciting Kigali is in comparison. 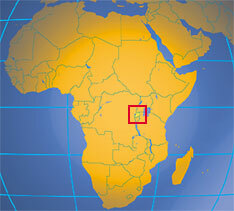 Kampala is a serious bustling metropolis and has the real city gritty feel and pushiness that Kigali lacks. If Kampala is the NYC of East Africa, I’d say Kigali is the Boston; it has a small town feel, a few tall buildings, and its fair share of one-way streets. Some of the most interesting/nerve-wracking/exciting/treacherous parts of the trip were the two 8-hour bus rides between the cities. Passing through the border, located about an hour out from Kigali, was a serious ordeal: we all had to get out of the bus and walk the mile across the border through no-man’s land. Both times we were greeted with swarms of money changers brandishing fists of Rwandan francs and Ugandan shillings at exorbitant rates. We successfully powered through, Red Rover style. While crossing back into Rwanda around 4 am, we spent half an hour waiting outside the bus while customs officials searched fastidiously for luggage that could be smuggling in illegal goods or plastic bags. Yes, that’s right – it is illegal to have any plastic bags inside Rwanda, for what I believe to be both environmental and aesthetic reasons. Another interesting part of the return trip was that one of the lights at the front of the bus caught fire and for the rest of the trip there was a pungent smell of burning wires. Needless to say I didn’t get the best night’s sleep. It’s nice to be back on land and back in my small town. I guess it takes going away for a little while to realize that I feel quite at home here in Kigali. One of my favorite parts of working at Generation Rwanda is coordinating workshops and trainings for students. Not only do the students enjoy them and get a lot out of them, but I also find the content interesting and enjoy the opportunity to hone my skills of organization, coordination, management, networking, public speaking, and more. Throughout the academic year and during vacation, Generation Rwanda offers students a variety of workshops led by professionals, staff, volunteers, trainers, other students, or some combination of the above. The majority of the workshops are mandatory and a few are optional; the mandatory ones are offered several times throughout the year. My first opportunity to coordinate a workshop was during September’s new student orientation, when I helped organize one on conflict resolution. It delved into theories of macro- and micro-level conflict, examples of conflict from daily life and from Rwanda’s history (there are unfortunately a lot there), and tools for conflict management and transformation. The workshop was led by a professional conflict resolution trainer and also featured older student leaders who shared their experiences resolving conflicts in their daily lives. A few weeks ago I organized and led a workshop on “How to be a Mentor” for WE SHARE, a student community service group dedicated to sharing their skills and experiences with younger students in need. WE SHARE is planning to start a type of “big brother / big sister” mentoring program between Generation Rwanda WE SHARE students and students in secondary schools who are also orphans and have experienced similar hardships. Mary, my friend and colleague here who is getting her Masters in social work, helped develop the curriculum and led the training with me. It was well-attended and the students all said that they found it very valuable and were now comfortable becoming mentors for younger students. I realized how much I enjoy leading workshops, facilitating discussions, and speaking in front of a group – it’s really quite fun and rewarding. I’m currently organizing what I think will be one of the most exciting workshops yet: a series of entrepreneurship trainings led by high-power Rwandan entrepreneurs. The training will take place over 5 days and will cover topics like opportunity recognition, SWOT analysis (strength, weakness, opportunity, threat), competitive advantage, cost/benefit analysis, market research, product development, advertising and publicity, negotiations, record keeping, budgeting, taxes, government regulations, business plan writing, and more. Those of you who know me well know that, being a bit averse to economics and finance, I couldn’t have developed the curriculum myself. However I have been in charge of singlehandedly connecting with Rwandan entrepreneurs and convincing them of why they should donate a day of their busy lives to share their skills and experience with our students. Starting out a few weeks ago with little more than the curriculum materials and the assignment from my supervisor to set up a workshop series for mid-November, I contacted the Generation Rwanda Entrepreneurship Club. They proved to be extremely proactive and had already compiled a list of local Rwandan trainers and organizations to contact for entrepreneurship training. I got in touch with the first contact on the list, who is the current president of Junior Chamber International – Rwanda Chapter. It was almost too easy: he and I set up a meeting, he invited other JCI members who are certified trainers with relevant experience and fairly flexible schedules, and all four were very enthusiastic and committed to leading one day of the workshop each. The trainers include the CEO of the largest medical supplier in Rwanda, the managing director of a large bookstore in Kigali, a management and development consultant at a global consulting group, and a finance and management consultant certified by the International Finance Corporation. Meeting with these entrepreneurs from diverse fields and facilitating a surprisingly productive meeting made me realize that when I set my mind to something, I can actually be pretty effective. It was especially rewarding to see such generosity and excitement from these businesspeople at the chance to impart their skills to university students from vulnerable and underprivileged backgrounds. I’m excited that the workshop will be entirely Rwandan-owned and Rwandan-run because I believe one of the most important aspects of international development work is that it is locally owned and locally resonant. I’m sure it’s going to be rewarding for the students – and maybe I’ll even learn a thing or two myself. And then I found this character hanging out by my shampoo. Who needs to go outside when nature comes to you?